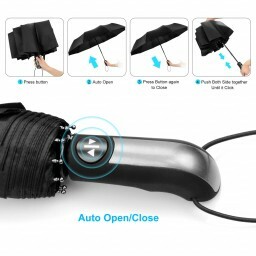 ☂AUTO OPEN/CLOSE - ESEOE automatic one-touch switch travel umbrella, the one-handed operation is convenient and fast, simply pressing the button will auto open/close in 1s, allowing you to quickly get in the car or house. 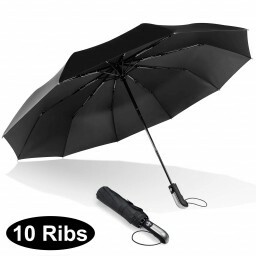 ☂STRONG, WINDPROOF – We’ve enhanced the 10 ribs so that they can withstand strong gusts of wind, it’s a more durable windproof umbrella than an ordinary umbrella. It can last against in winds up to 60 MPH, providing you security even in bad weather. ☂EXCELLENT WATERPROOF PROTECTION – The ESEOE Travel compact umbrella is made of high-density 210T polyester fabrics material to enhance its water resistance. It can withstand heavy rains and strong winds, and provides good protection against potential UV ray damage. 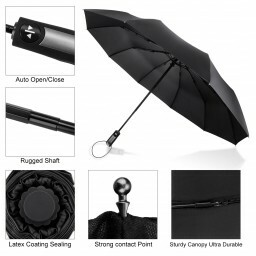 ☂PREFECT TRAVEL SIZE - Portable and folding umbrella,3 segmented retractable portable design, folds down to 13 inches. 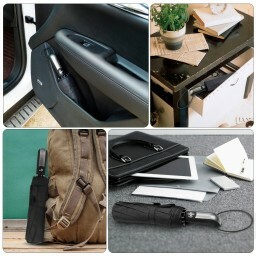 It is easy to hold in a backpack, suitcase, briefcase and more. It’s your perfect city companion! ☂LIFETIME WARRANTY GUARANTEE: 1x Travel umbrella; 1x umbrella case. We promise a 90 day refund and lifetime warranty. Customer is our first consideration,Don’t hesitate to contact us if there are anything we can do for you, we’ll reply you within 24 hours.